In Part I of Checks and Balances, I speculated that Anakin Skywalker’s true purpose as the Chosen One was not only to kill Darth Sidious, but to “prune” an ineffectual and misguided Jedi Order down to a lower number which could more easily evolve to meet the challenges of the modern galaxy. Not everyone will agree with a perspective that doesn’t necessarily see the Jedi as positive actors in the Force’s interests, but it was important to start there so that you might understand where I’m coming from here in Part II. A few years back, while reading a book on demography called The Coming Population Crash, I started wondering what the Jedi Order would look like if unchallenged for its entire 25,000-year history, given what we’ve seen of Force sensitivity’s heritability. From there, it occurred to me that perhaps the Sith were meant to exist, from a cosmic point of view—that widespread, high-level Force use was something of a threat to the general galactic population, and the fact that both Jedi and Sith—in service of the Force’s natural dualism—were constantly trying to wipe each other out was in reality a form of population control, baked into the galaxy’s natural state, to keep it from ending up with a civilization comprised entirely of dangerous and unpredictable Force wielders. This story happened a long time ago in a galaxy far, far away. It is already over. Nothing can be done to change it. In my ongoing feature The Expanded Universe Explains, I go out of my way to maintain a lighthearted, conversational tone to add a little flavor to what is essentially just a recitation of secondhand information—book x said this, which was expanded upon by a stray line in reference book y. It’s all fairly absolute, to the extent that made-up information can ever be absolute. What I mean to say is, I originally thought about covering this topic in an EU Explains piece, but I have to admit that as clear as it may seem to me, there are few things in the Star Wars saga that are more subjective than the Prophecy of the Chosen One. Reasonable minds can disagree on the following, but this is How I See It. What does it mean for Anakin Skywalker to have brought balance to the Force? 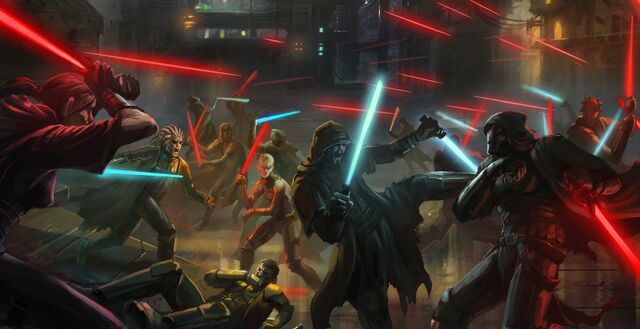 Like most things of any significance in the Galaxy Far, Far Away, the history of the Sith is long and convoluted. By the time you read these words, the final thirteen episodes of The Clone Wars will have made their debut on Netflix, including an arc revolving around this very subject. But while the details are constantly evolving (to use a charitable word), what we can say is this: the dark side has always been with us. When Luke agrees to train Rey in The Last Jedi, the first thing he asks her to do is explain the Force. She says it’s the power to “control people and make things float.” It’s played as a joke, one the audience is expected to be in on. But really the joke’s on us. While we’ve all heard Obi-Wan and Yoda explain what the Force is countless times, the Star Wars fandom is constantly proving that we still don’t get it. Every time someone suggests Jar Jar’s Drunken Fist fighting competence proves he’s a Sith, or writes a story implying that the Force blew R5-D4’s motivator, we show we still think of the Force like Rey—just a box you have to check to unlock the skill tree of cool powers. Part of the problem is that the explanations Jedi like to give aren’t actually very clear. Calling everybody “luminous beings” doesn’t shed much light on the question. There’s a simple answer, but it’s dressed up behind a veil of Orientalist mysticism that makes it hard to extract. I can’t say it ever occurred to me until I read Nick Lowe’s Well Tempered Plot Device. Fair warning: once learned, it can’t be unlearned. The Force is the plot. It’s that simple. Every single thing in the story, from the luck of a sabacc draw to the very fabric of the entire GFFA, is the Force. “Nothing happens by accident” because everything in the story is a conscious decision by the author. » Read more..
Editor’s note—several months ago, during the planning phase for my recent feature Checks and Balances, I asked Go Figure author Michael Lind to explore any existing data he could find on Force sensitivity throughout the ages in the Star Wars galaxy, and to what extent it appeared to be an inherited trait from one’s parents. While his conclusions veered off somewhat from my original hypothesis—that Force-users were effectively a contagion and would’ve subsumed the regular population of the galaxy if not for the constant warring of Jedi and Sith—they presented a fascinating picture of how Force heritability might actually work; one that drastically changed how I thought about the Galaxy Far, Far Away. My own final piece on the subject can be found here, and below I am proud to present Michael’s original response in its entirety, with only minimal copy-editing, that our readers might be similarly enlightened. – Mike Cooper » Read more..